Portugal didn't get much trouble to get past Faroe Islands this Thursday night, as they beat them 5-1 at the Estádio do Bessa XXI. 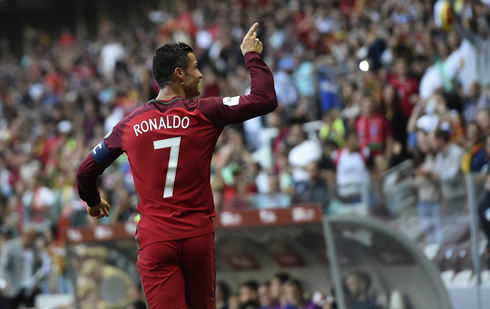 Cristiano Ronaldo bagged another hat-trick and has now 78 goals for his country. Portugal won their 6th straight game in the 2018 FIFA World Cup Qualifiers and their last victim was Faroe Islands this Thursday night. The European champions ran over a very fragile side in a 5-1 win and the man of the match was none other than Cristiano Ronaldo. The Portuguese and Real Madrid superstar scored an hat-trick and reached his 78th at a national level, surpassing Pelé's 77-goal record for Brazil. The remaining 2 goals in this game were scored by William Carvalho and Nélson Oliveira. The next qualifier is now on Sunday, an away fixture against Hungary. No one seriously expected for a different outcome than the one we've seen last night in Porto and at the end of the day, it was all a matter of knowing how many goals Portugal would score. Nevertheless, Fernando Santos didn't take any risks and fielded his strongest possible eleven even knowing he has a far more difficult match next Sunday in Hungary. Against all odds, Faroe Islands somehow managed to shorten distances and bring the lead to a single goal difference again. It all started in a throw-in, a small deflection on José Fonte's head and bang! Rogvi Baldvinsson smashed it into the back of the net in a first touch strike. Sporting's goalkeeper Rui Patrício couldn't have done much more to stop such a powerful shot from such a short distance. Halftime would arrive just a few minutes later and with the game's discussion still opened, the Portuguese side decide not to slow down things in the remaining 45 minutes. The 3-1 was the result of a good cross from Ronaldo and an even better finish from William Carvalho. The 25-year old midfielder headed the ball into the far post and scored his 2nd goal in the current WC qualifiers campaign. 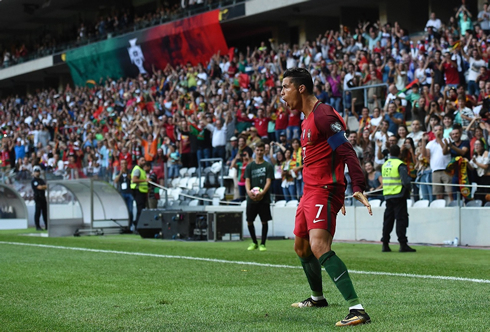 From then on, it was all a formality... Cristiano Ronaldo would complete his hat-trick in 64th minute, reaching his 78th goal for Portugal and reaching the 5th place in the all-time topscorers at international level (the first is still Ali	Daei, from Iran, with 109 goals). Finally, the last goal of the night was scored by Nélson Oliveira, following a cross by Ronaldo and a bad clearance from a Faroe Islands' defender. 3 points and the next in line is now Hungary! Attackers: André Silva, Cristiano Ronaldo. Cristiano Ronaldo next game is for Portugal on September 3 of 2017 against Hungary. 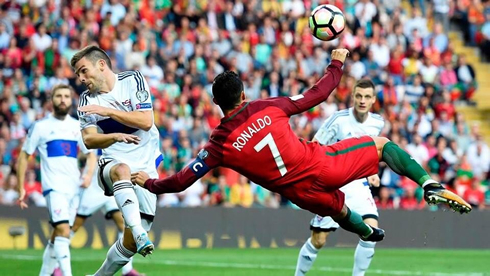 You can watch Juventus live stream, Hungary vs Portugal, Spain vs Italy, Malta vs England, Lithuania vs Scotland, and Czech Republic vs Germany, all matches provided from our sports streaming game pages.